Gone are the days of traditional matching sets. Today the trend is to combine several different sets of dishes and platters to create a curated collection of mismatched dinnerware. Years ago it was popular to receive a traditional set of wedding china that was used for special occasions and passed down to other generations. The goal was to get a complete matching set of plates, platters and servingware. If Uncle Bob broke your perfectly matching platter during Thanksgiving dinner, well, you were out of luck unless you were able to hunt down a replacement piece. Luckily as our dining habits evolved to a much more casual approach, so has our perspective on setting the perfect table. Today is much more acceptable (and often preferred) to mix and match dinner sets and let your collection evolve with your life. For example, pair that casual set you picked up for your first apartment with a formal set you received as a wedding gift and incorporate a few of Grammie’s coveted china pieces. Add a few items with seasonal flair or a pattern just for fun and you’ll have a well-curated collection in no time. Love the mismatched dinnerware look but afraid your table will look more like a box of crayons than an intentional collection? Try using a variety of patterns with a cohesive metallic accent. 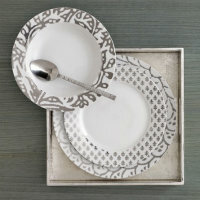 This lattice-inspired set is a definite upgrade from the standard metal rimmed plates sold in sets from big box stores. Pair it with a crisp white set for an elegant setting or incorporate an accent color to make it pop. If you love to decorate your tablescapes for the seasons, then consider getting a set that would be easy to incorporate into your decor. This copper accented garden motif would look lovely on a fall-themed tablescape. Add a few pumpkins and fallen leaves down the middle of the table for instant fall decor. Update it for Christmas by adding a few Christmas trees in copper shades for a stylish setting. Pair it with white and brown serving platters for holiday entertaining. 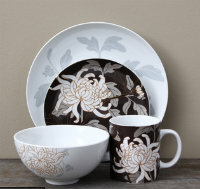 An example of how to combine pattern plates with solid accents, this 16-piece dinnerware set is accented with hand painted flowers. This setting is for four, but if you’re looking to expand your set further, pair it with accent plates in brown, tan or turquoise. Gold chargers or napkin rings would dress this setting up for special occasions. For a more whimsical feel, check out this Taika dinnerware series. With backgrounds of white and midnight blue, there is room to play around with an assortment of color combinations depending on the mood desired. Pair the darker plates with an inky blue hue or bronze shade for a winter dinner party. 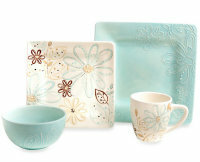 Combine the white sets with periwinkle or light blue accent plates for a feminine tea party. You can order each piece individually to create a custom collection.